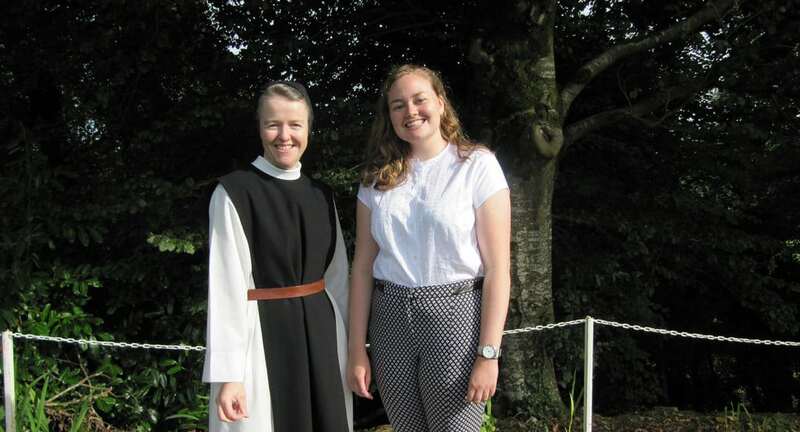 On the 8th September, 2018 we were delighted to welcome Emma Brady from Co. Cavan as a new Postulant to our community. Emma began her vocation discernment with us during her college years, where she studied Law and German at university before applying to enter St. Mary’s Abbey, Glencairn. Emma’s entrance day was the Feast of the Nativity of the Blessed Virgin Mary, which celebrates Mary’s unique vocation in God’s plan of salvation. The liturgy for this feast expresses the rejoicing of humankind at Mary’s birth, her ‘yes’ to God, and the joy of the gift of our own vocation in God’s plan. We pray for Emma as she takes this first step on her monastic journey, that she will be graced with deep peace and joy, courage and wisdom, and every happiness in the Lord. Sincerely wishing Emma every blessing as she steps into the wonderful Cistercian way. May Mary be your constant guide and companion and I will keep you in my prayers . Emma, you have started a sacred journey in the company of a very fine group of women and their animals in a very beautiful and Godly place. Give this time everything you have got, enjoy and laugh often, walk the fields and pray and dance in your heart. I know the Lord will delight in you!! Well done for taking the step – I hope you find your soul and pursue your dreams and take on HIs life and recognise Him as part of yourself.